The Society of Mary exists to foster devotion and praise to the Blessed Virgin Mary, the mother of Jesus. Members gather the third Sunday of each month in the chapel after the 10:30am mass to pray the rosary, and at other times when announced. Our church is very proud of our shrine to Our Lady of Walsingham, which sits just outside the entrance to the chapel. 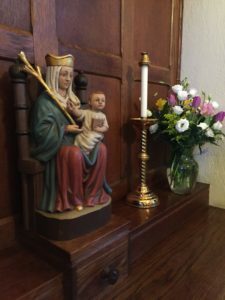 The statue of Our Lady is carved of Linden wood and was brought back to our parish from the shrine in Walsingham, England, by a group of pilgrims in May 2015. 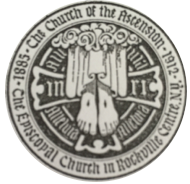 For more information about the Society of Mary please contact Ken Mensing. The Guild of All Souls is devoted to regular intercessory prayer for the departed. 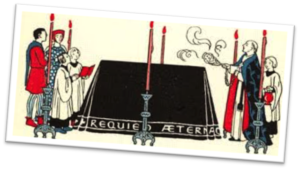 The guild sponsors an annual requiem mass for the souls of the departed, and participates in National Guild services. The guild is committed to the promoting two key doctrines of our creed: the Communion of Saints and the Resurrection of the Dead. For more information on joining the Guild of All Souls please contact Bill Cooper.